The Scimitar Cat (Homotherium serum) was a smaller and lesser known cousin of the more famous Saber-toothed Cat (Smilodon fatalis). This species lived from the early Pliocene to the late Pleistocene and enjoyed one of the largest geographic distributions of any known cat living or extinct. 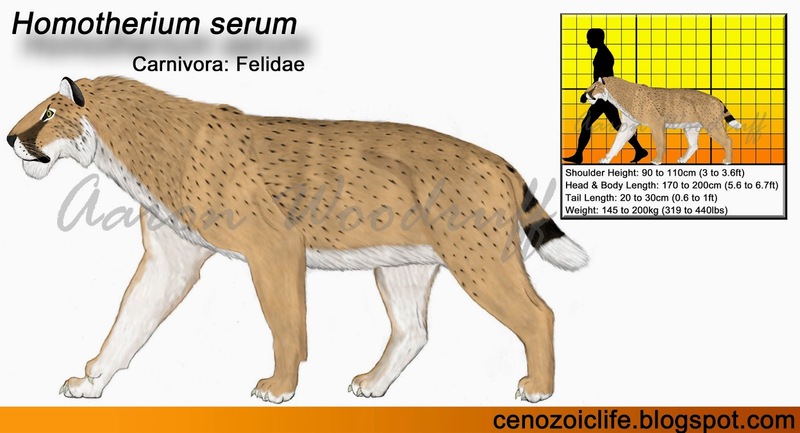 The genus name Homotherium is derived from the Greek words homo, meaning “same”, and therion, meaning “beast”. The common name “Scimitar-toothed Cat” or “Scimitar Cat” is in reference to this cat’s blade-like canines, named after the curved sword from southwest Asia. Numerous species have been attributed to the genus based on body size, the shape of the canines, and geographic location. However, these supposed differences are minor and may be attributed to sexual and geographic variation. It must be noted that such fluctuations may easily be observed among modern cats which have particularly broad distributions. 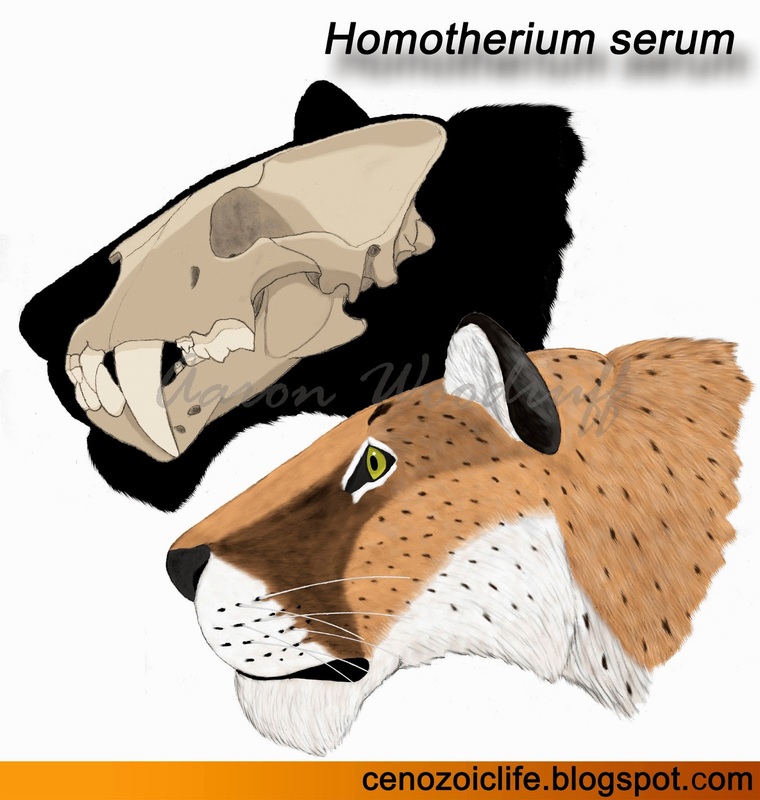 Here, I will be focusing on the North American variant of this genus, Homotherium serum. 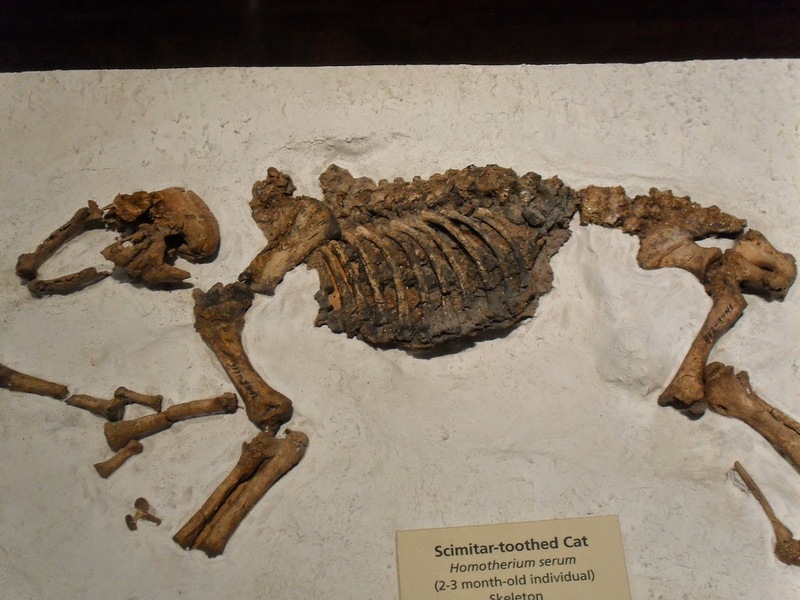 Scimitar Cats had an extremely wide distribution that encompassed Africa, Eurasia, North America, and South America. This nearly global distribution was matched only by the Lion (Panthera leo) among contemporary felids. The Scimitar Cat’s preferred habitat would have been grassland, open woodland, and semi-desert. This species seems to have originated in Eurasia about 5mya during the early Pliocene, is recorded in Africa by 3mya, North America by the start of the Pleistocene, and reached South American pampas by at least 1.8mya. The extinction of Scimitar Cats around the world seems to coincide with the disappearance of many of the larger herbivores within its range. The youngest evidence for the species in North America is about 11,000 years old. Compared to comparably-sized cats of the Pleistocene, Scimitar Cats were much more lightly built and rangy in their overall body proportions. They were particularly well-adapted for covering great distances of open terrain at considerable speeds. Cursorial* adaptations include; long slender limbs to increase its stride, a deep thoracic cavity that housed a large heart and lungs, large nasal passages for high oxygen intake, a short lower back to save energy when running, and non-retractile claws for traction. The forelimbs were slightly longer than the hindlimbs. Scimitar Cats were built for long-distance pursuit rather than power, likely adopting a tireless cantering gait when running. As a cat of the open plains, its coat is likely to have been either mostly plain or spotted, the background color varying with region. In temperate zones, a light summer coat would likely have given way to a thicker, darker-colored winter coat. The cats’ most impressive feature was its highly sectoral* dentition. All the teeth were lined with fine serrations on their front and back edges. The upper canines were up to 15cm (6in) long and blade-shaped. These killing teeth were well-suited for slicing through thick hide and severing blood vessels of large prey items. Large incisors were adept at gripping prey and dismembering carcasses. The carnassials* were extremely well-developed relative to contemporary cats and would have enabled Scimitar Cats to cut away steak-sized chunks of flesh with every bite. Among living cats only the Cheetah (Acinonyx jubatus) has such efficient meat slicing teeth, which are adapted for speedily devouring their prey on the competitor-rich plains in which they live. Much of what we know about the Scimitar Cat comes from the wealth of fossil materials unearthed from Friesenhahn Cave, Texas. Prior to the discovery of this site, Scimitar Cats were known only from very fragmentary remains elsewhere in the world. Once an active den site for these animals, this famous locality has yielded the remains of at least 32 individuals (19 adults and 13 cubs), providing unparalleled insight into the ontology, ecology, and behavior of these cats. The following description will be based on inferences made by the Friesenhahn sample. The disarticulated remains of large herbivores such as bison, horse, mammoth, mastodon, camel, deer, and tapir indicate that Scimitar Cats enjoyed a wide prey menu consisting of animals weighing 300 to 1,000kg. By far the most notable aspect of this cave fauna, however, are the bones and teeth of several hundred juvenile Columbian Mammoths (Mammuthus columbi) and some American Mastodon (Mammut americanum). The young elephants were determined to have been between 2 and 4 years of age around the time of death. This is the same age at which modern elephant calves become less dependent on their mothers and their curiosity occasionally compels them to stray dangerously far from the protective adults. Thus, this is the period during which they are most vulnerable to attack from predators. Lions today will take full advantage of this behavior and opportunistically hunt these stray calves. Scimitar Cats, it seems, were doing the same thing with the mammoth and mastodon calves from the Friesenhahn locality. The great size of the animals that Scimitar Cats were hunting also tells us something about its social life. Averaging about the weight of a Lioness and more slender in build, Scimitar Cats would have found it rather difficult, if not impossible, to tackle such large prey single-handed, particularly the larger bison and elephant calves found at Friesenhahn. Thus, these cats most likely lived and hunted in groups. It can even be suggested that the Scimitar Cats at Friesenhahn represent a single family lineage that utilized the cave and surrounding area over successive generations as modern Lions are known to do. The cave would have been used as a shelter during the dry season and a safe environment in which to leave their cubs while hunting. It also offered a permanent supply of water. The cave would have been abandoned during the wetter periods of the year from May to October due to flooding. The home ranges of Scimitar Cats are likely to have been quite large and the cats would have been highly nomadic within this area. Seasonal movements depended on the migratory habits of local prey. As a result, the species had a relatively small population density compared to other large predators of the time. Unlike other cats, Scimitar Cats were built for long-distance pursuit rather than ambush. Hunting techniques would have varied according to the type of prey, but in general these predators would have isolated and chased down intended victims, seizing them by the rump or hindquarters with enlarged dewclaws* in order to prevent escape. Other pack members would have then attacked the hindlimbs and throat of the immobilized prey, severing tendons and blood vessels with their blade-like teeth. The prey would have been killed rather quickly rapid blood loss. Kills would then be torn apart and eaten as rapidly as possible before competing predators could arrive on the scene. Powerful shoulders allowed Scimitar Cats to lift and carry away large pieces of surplus meat over long distances to a safe place to be consumed at a later date or fed to den-bound cubs. Cursorial: adapted specifically for running. Dewclaw: any digit that is typically raised above the ground during regular locomotion. Sectoral: adapted specifically for cutting.